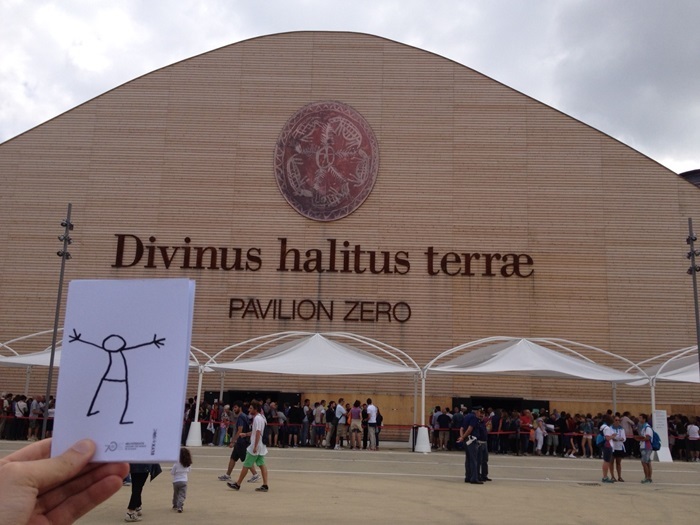 Italy (Day 1): Elyx discovers the EXPO Milan 2015! It’s the World Food Day and what a better place to celebrate it than Italy, the country with a renowned love for food? On this special occasion, the UN is holding the official celebration event at the Expo Milan 2015. Of course among the special guests was our digital ambassador Elyx! The World Exposition will host one of its biggest events, as the official ceremony will cover the theme for World Food Day 2015, “Social Protection and Agriculture: Breaking the Cycle of Rural Poverty” and commemorate FAO’s 70th Anniversary. Elyx is glad to join this event, especially because it is a great opportunity to share the newly adopted Sustainable Development Goals (SDGs) and the need to improve food security, nutrition and sustainable production and consumption. 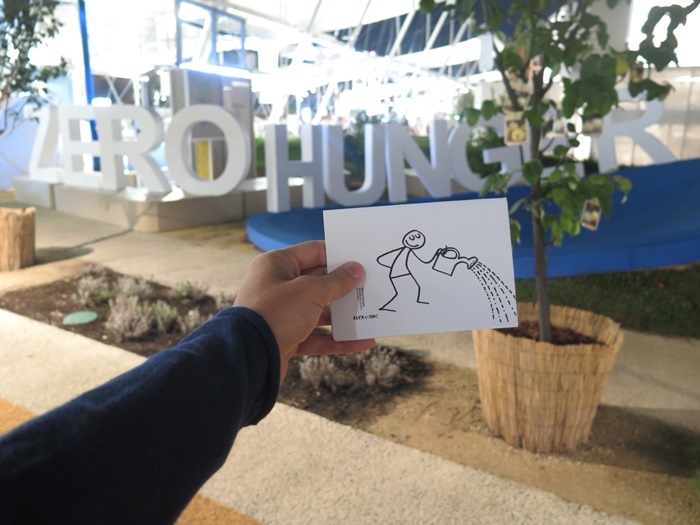 Elyx learns more about the UN “Zero Hunger Challenge” (Photo Credit: UNRIC/Frederik Bordon). Before exploring all the pavilions of the Expo, Elyx is invited to learn more about the UN theme chosen for the World Exposition which is “The Zero Hunger Challenge – United for a Sustainable World”. This ambitious call for action is comprised of five specific elements: zero stunted children in less than 2 years; 100 percent access to adequate food all year around; that all food systems are sustainable; 100 percent increase in smallholder productivity and income and zero loss or waste of food. The message is very clear and Elyx is happy to share it: “when talking about hunger, the only acceptable number is zero”. Elyx explores the UN Garden, where visitors can learn more about the Zero Hunger Challenge (Photo Credit: UNRIC/Frederik Bordon). 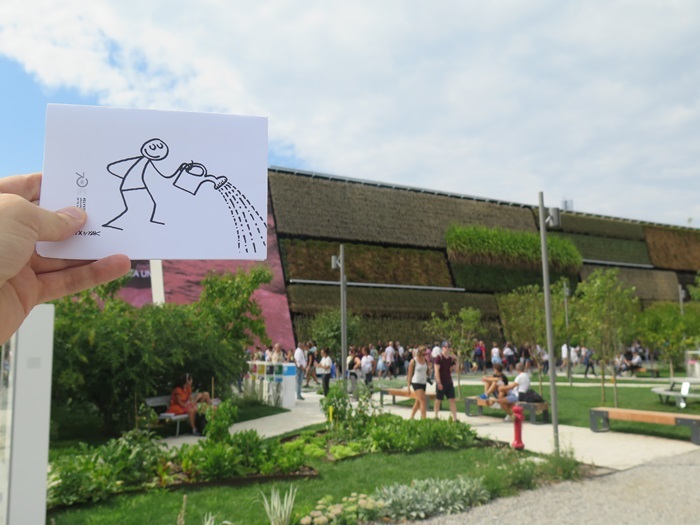 Elyx visits the UN Garden, which is one of the most engaging spaces dedicated to the UN. In this area, indeed, visitors can participate in several activities to better understand the UN theme, but also see examples of the active field work by UN agencies in the various development programs and humanitarian emergencies. 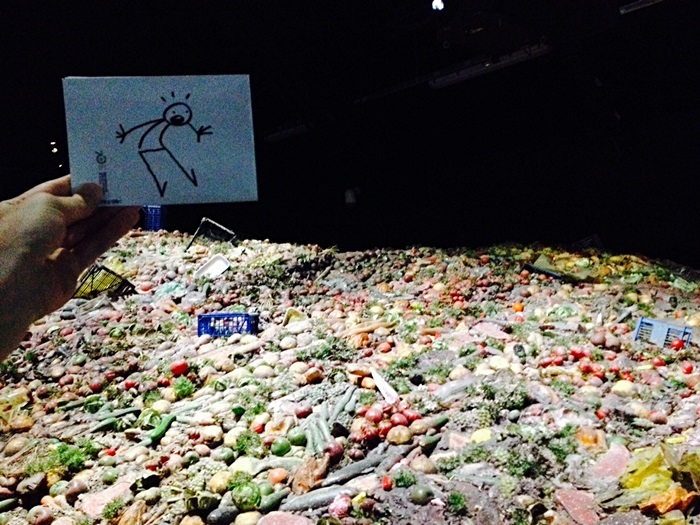 Elyx is shocked by how many food is wasted every year (Photo Credit: UNRIC/Frederik Bordon). 1.3 billion tons of food is wasted every year and there are over 160 million of children who are stunted inadequate access to nutritious foods. Elyx is shocked to hear these facts, but at the same time is determined to use this visit to help further encourage, especially to young people, to do more to stop hunger. Elyx joins the UN team at Expo in underlining the fundamental role of women in the fight against hunger. Diverse causes lead to the malnutrition of women, which in turn is a threat multiplier for food security for the whole family, notably for the children’s health. 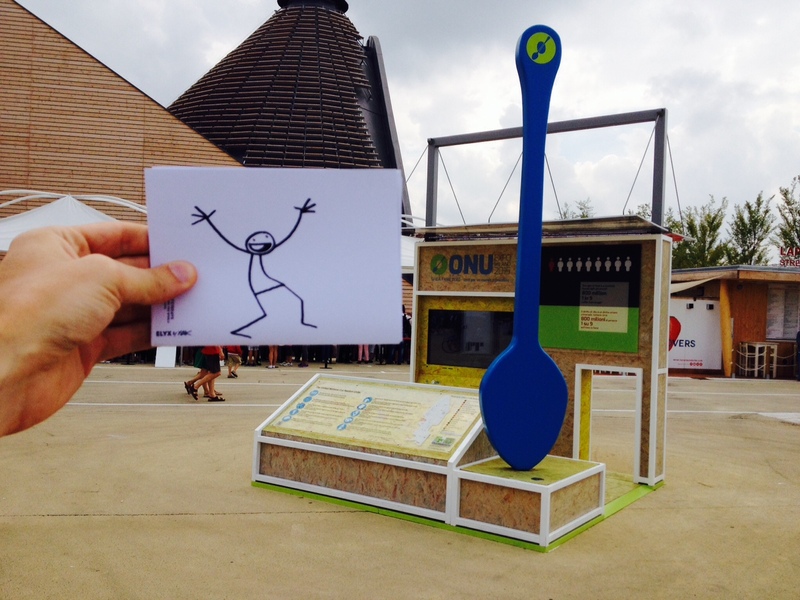 The experience at the Milan Expo is overwhelming and Elyx is really happy to be part of it! After traveling a lot, our digital ambassador is enthusiastic to see the pavilions of the countries already visited, but also to discover new ones, by tasting and enjoying food from all over the world. 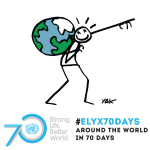 Elyx thanks the people behind the Milan Expo for this opportunity and urges on the World Food Day celebrations! Tomorrow Elyx is looking forward to experiencing other parts of Italy before heading to Mali that evening!